Fibonacci was a very good fellow, who lived in Pisa at the end of XII - beginning of XIII centuries. He was the one after whom the Fibonacci system was called. He was also good, because he introduced Hindu-Arabic numeral system, which was a very good introduction to the European world. Can you imagine 1887 written like this - MDCCCLXXXVII? But his brilliant offer has nothing to do with the issue we are going to discuss right now. Fibonacci was the one who applied number sequence in mathematics. He did not discover it but the entire world decided that it would fair enough to call it after him, made it so popular and developed to the form we know it now. 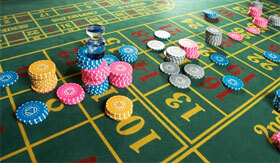 This system should be applied to the roulette game, as it would not work out in the logic games. The system is 1, 1, 2, 3, 5, 8, 13, 21, 34. It goes like this 1 - 1 - 2(1+1) - 3(2+1) - 5(3+2) and so on. The next number is a sum of the two previous numbers - that is the system according to which it works. Some clever or, rather, "clever" men decided to apply it to the gambling games, where the winning depends on luck. It is a progressive system. You make a bet, let's say $5. When you win, you bet the same $5. When you lose, you bet $5. If you lose again, you bet $10 ($5+$5). If you lose one more time you, you bet $15 ($10+$5). If again you lose, your bet will be $25 ($15+$10). For example, you win the next bet with $25, then you cross out the last two units you made bets at ($25 and $15) and bet the third from the end ($10). Do not confuse it with the Martingale system, which tells you to double the bets, if you lose. It is not an arithmetical progression, where the added number is constant. But the experts suggest applying this system only in low bets and for a short time, because your loss can be immense. And it is quite time-consuming for somebody, who wants it fast. And there is a little profit. There are lots of interesting facts connected with Fibinacci numbers - these progression can be met even in nature! For example, in sunflower you can see that the numbers are somehow connected.